– This process is very interesting to me. As a commercial designer I am used to working from a brief that is given by a client, so I am very much concerned with solving their issues rather than exploring my own questions. But in my personal art practice I still create a brief for myself even in as much as I start out with an idea, a question or a goal. I very rarely start working with no ‘plan of attack’ when creating art, so in that sense I am creating my own ‘brief’ and ‘process’ that is not dissimilar to that used when creating a design piece. This is a messy work-in-progress but it’s a starting point for me showing my thinking and the current interrelations in my areas of interest. I’m particularly interested in the intersection where ‘Brand’ becomes a magical language that effects change in the world through visual cues, and the intersection where Infographics and mapping can be used to convey both occult and design practices. Steven Heller, Design Critic and Historian, Essay in “Things I Have Learned in My Life So Far”, Stefan Sagmeister, 2008. What makes design distinct from art? Where do you draw the line? What makes this piece of work art, and this piece of work design? And why? These questions have been playing on my mind for the last 17 years. I felt that Stefan Sagmeister might provide some insight into this tricky inquiry, as he is the first contemporary graphic designer who springs to mind when imaging someone who continues to cross those boundaries. 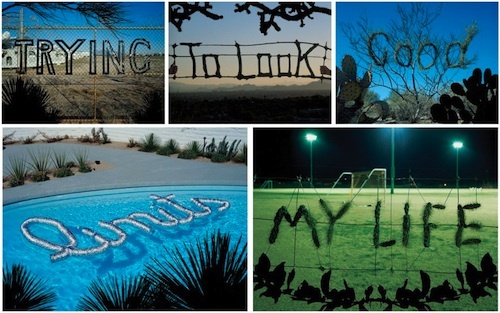 “Stefan Sagmeister’s series Things I Have Learned In My Life So Far refuses to behave itself. Drawn from an inventory of aphoristic thoughts compiled in his diary, this unruly project claims to be graphic design and not art. After all it’s numerous instalments were generated by commissions with commercial applications. Behind the facade of personal revelation, there were indeed products to endorse and brand identities to convey. However despite Sagmeister’s insistence otherwise, Things I Have Learned in My Life So Far occupies a space associated with art – specifically, the space of mass-media communication appropriated by Conceptual artists to escape the confines of the gallery system.” – Nancy Spector, Chief Curator, Guggenheim Museum, Essay “States of Wonder” in “Things I Have Learned in My Life So Far”, Stefan Sagmeister, 2008. “… the essence of art is to foster the kind of uncertainty that results in questions, while the role of design is to enhance communications that can lead to answers.” – Steven Heller, Design Critic and Historian, Essay in “Things I Have Learned in My Life So Far”, Stefan Sagmeister, 2008. “I purposely avoided turning the typography into a direct reflection of the content (say, by forcing the type into a circle closing in on itself), thinking that, considering the straightforwardness of the sentences, matching straightforward typographic form would create a closed system requiring no mental participation of viewers and consequently leaving them unengaged. I think that all of these qualities are present in separating design from art, but it still feels like a complex and difficult boundary. The ideas of utility of purpose and the directness of the communication (usually eliciting a desired action or outcome) are certainly areas I have identified in my practices as both commercial designer and artist. I don’t feel that the commercial transaction (e.g. a piece commissioned by a client) is a relevant differentiator, as artworks can be commissioned, be paid for and, therefore, be items of commerce without losing their legitimacy as ‘art’ pieces. But maybe the ‘Design Brief’ is a differentiator as the client is able to dictate the desired outcome of a design project, but does not usually do this for an artwork (except, historically, a portrait work). “If I Want To Explore A New Direction Professionally, It Is Helpful To Try It Out For Myself First”. 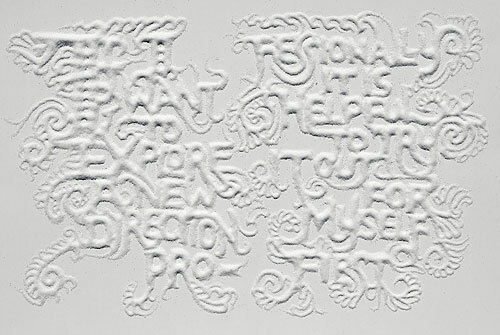 Typography created by Marian Bantjes. “I, like Stefan, also try out new directions and experiments on my own, which often end up in the professional realm later on. Creating in sugar is one of these things …” – Marian Bantjes, quote in “Things I Have Learned in My Life So Far”, Stefan Sagmeister, 2008. This piece was interesting to me because it was a collaboration between two ‘designer’ who are also ‘artists’ by taking an experimental approach to their creativity in order to free themselves from the confines of The Design Brief, before bringing what they have discovered back to their commercial practices. “Complaining is Silly. Either Act or Forget”. “The billboard commissioned for Lisbon by Portuguese beer brand Super Bock consists of twenty large sheets of regular newsprint paper. We took advantage of the fact that newsprint yellows significantly in the sun and built gigantic cardboard stencils for the 3 x 8 metre billboard on the roof of our studio in New York. After the newsprint was exposed to the sunlight for a full week, we removed the stencils. the areas underneath remained completely white, while the surrounding background had turned yellow, and the text became readable: Complaining is silly. 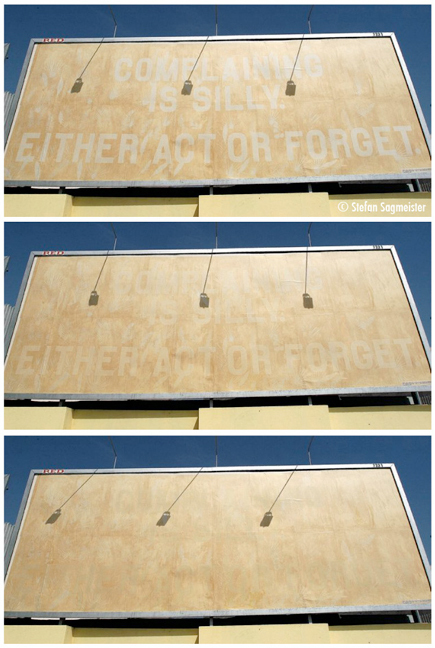 Either act or forget. We rolled the exposed newsprint up and shipped it to Lisbon, where it was put up in a very sunny spot in front of the Centro Cultural de Bélem. 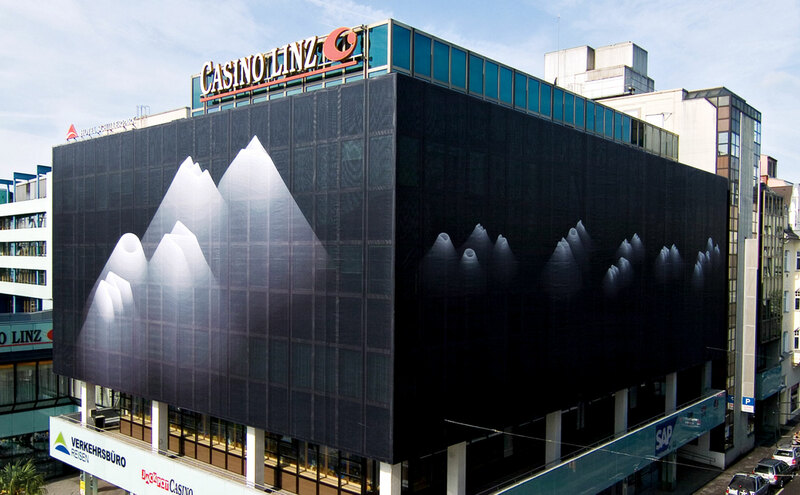 Within a week the typography (and all the complaining) slowly faded away.” – “Things I Have Learned in My Life So Far”, Stefan Sagmeister, 2008. I liked the ephemeral nature of this work and how it’s message was conveyed by the lifecycle of the substrate on which it was displayed. This piece was interesting because of the way it acts like an advertisement, but the message being advertised is very personal, is not selling a product or a brand, but is definitely promoting a clearly articulated idea to it’s audience. Getting paid to promote the idea that money does not equal happiness must be the ultimate coup!